Computer Numerical Control (CNC) controllers are high value-added products counting for over 30% of the price of machine tools. The development of CNC technology depends on the integration of technologies from many different industries, and requires strategic long-term support. “Theory and Design of CNC Systems” covers the elements of control, the design of control systems, and modern open-architecture control systems. Topics covered include Numerical Control Kernel (NCK) design of CNC, Programmable Logic Control (PLC), and the Man-Machine Interface (MMI), as well as the major modules for the development of conversational programming methods. The concepts and primary elements of STEP-NC are also introduced. A collaboration of several authors with considerable experience in CNC development, education, and research, this highly focused textbook on the principles and development technologies of CNC controllers can also be used as a guide for those working on CNC development in industry. This book is designed to help readers develop a good general working knowledge of programmable controllers with concentration on relay ladder logic techniques and how PLC is connected to external components in an operating control system. 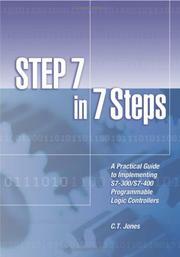 The book uses real world programming problems that readers can solve on any available programmable controller or PLC simulator. Later chapters relate to more advanced subjects in machine controls making this a welcome addition to a personal technical reference library. KEY TOPCIS: The authors examine ladder diagram fundamentals, the programmable logic controller, fundamental PLC programming, advanced programming techniques, mnemonic programming code, wiring techniques, analog I/O, discrete position sensors, encoders, transducers, and advanced sensors, closed loop and PID control, motor controls, and system integrity and safety. For those involved in Electrical, Automation, Control, and Process Engineering. This manual describes installation and operation of the CP-series Programmable Controllers (PLCs) and includes the sections described below. The CP Series provides advanced package-type PLCs based on OMRON’s advanced control technologies and vast experience in automated control. Please read this manual carefully and be sure you understand the information provided before attempting to install or operate a CP-series PLC. Be sure to read the precautions provided in the following section. This manual is intended for first-time users of the SYSMAC CP series. The basic use of the series is explained based on SYSMAC CP1L. For CP1E uses, please transpose "CP1L" to "CP1E". The differences between CP1L and CP1E are explained by notes or headings. Circuit configurations, wiring methods, and programs provided in this manual are given strictly as examples. When constructing an actual system, check the specifications, performance, and safety of each component by referring to the respective manuals. Ladder programs in this manual are provided strictly as examples. When designing the actual circuits, take adequate safety measures. This will fill my holiday's free time!